BDHR Entertainment & Sick Flick Productions present Hatchet Lady. Hatchet Lady plays upon all those inherent fears that we experienced as a kid of a being alone in a spooky old forest, of hearing urban legends involving blood thirsty madmen who roamed around searching for their latest victim, but modernizing it with a feminine twist. In Hatchet Lady, a young couple escape to a forest to engage in some tom foolery, but they should have paid attention to the local warnings of a "Hatchet Lady" who roams the forest looking for her latest victim, because this urban legend is about to become the stuff of real nightmares! Starring in Hatchet Lady is Julie Anne (No Strings 2: Playtime in Hell), Andrea Collins (The Deepening), Ryan Sandefur (MTV's Teen Wolf: Season 2) and Gita M. McCarthy (Deadlands II: Trapped). Funding for Hatchet Lady has been secured and filming is set to take place in late July. Producer - Brandon Sites: Brandon Sites is the founder of the now defunct Big Daddy Horror Reviews, one of the top 5 ranked horror blogs in the country*. In 2012, Brandon Sites decided to shift his focus from horror blogging to independent horror film production. Hatchet Lady will mark the first film to be produced by BDHR Entertainment. BDHR Entertainment also has two feature length productions that are currently in pre-production - Trespass at Your Own Risk & Drive-In Massacre. Written, Directed & Co-Produced by Jonathan A. Moody - Jonathan A. Moody is the mind behind such efforts as Scream Queen Campfire starring Sierra Holmes of VH1's Scream Queens: Season 2. 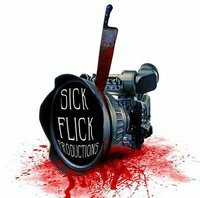 Jonathan A. Moody is committed to developing his own brand of homegrown, independently produced short horror films in the state of Virginia under the Sick Flick Productions label. Jonathan A. Moody hopes to use his experience in creating short horror films as a catalysis to developing future length projects.